Yammer is a business social networking platform that helps companies manage their internal communications. Users call it the ‘Business Facebook’, mostly in order to describe how intuitive and user-friendly its interface actually is. The reason why Yammer is so corporate-friendly is that it can only be accessed with a working email registered in the company’s computer domain. The software enhances communication via many different channels, and includes a large document repository and opportunities for collaborative document creation. It protects critical information, integrates easily with many other platforms, and it is also available on all mobile devices. Currently, the company is introducing a variety of advanced features such synchronized sharing and real-time group editing. Yammer brings small, mid-sized, and large teams together, and helps companies boost collaboration and learn how to make the most of their services. The tool provides an open platform for brainstorming and creative ideas, triggers intelligent business solutions, and unifies access to information. Once communication is improved, employees feel recognized and are eager to contribute, and productivity starts moving in an upper line. There are no last moment meetings and repetitive emails, but everybody is informed and manages to participate. At the same time, the social network is private, and unauthorized persons can’t access the information being stored inside. Transferring communication to Yammer saves time and leaves reasonable funds intact at the end of each month, which is exactly what makes Yammer so popular. But how does this actually happen? Yammer is an intelligent system that gathers, stores, but also evaluates information, and uses a robust set of analytic tools to pull off reports based on it. A huge incentive to use Yammer is its capacity to store conversations, and to categorize them in a historical database. This means that every interested party will be able to access them, both from their office computers and mobile devices. Knowledge management is always an extraordinary benefit for a company’s management, especially if the company gets to ask questions, and organize surveys and polls. It's essential to note that virtually no app in the Collaboration Software category is an ideal solution able to match all the requirements of different company types, sizes and industries. It may be a good idea to read a few Yammer reviews first as specific solutions may dominate just in a very small set of applications or be designed with a very specific industry in mind. Others may operate with an idea of being simple and intuitive and therefore lack complicated functions desired by more experienced users. You can also find solutions that cater to a wide group of users and offer a powerful feature base, however this in most cases comes at a higher cost of such a solution. Be certain that you're aware of your requirements so that you purchase a software that offers exactly the functionalities you search for. 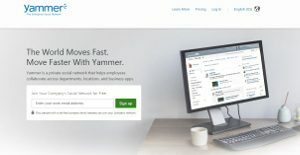 How Much Does Yammer Cost? We realize that when you make a decision to buy Collaboration Software it’s important not only to see how experts evaluate it in their reviews, but also to find out if the real people and companies that buy it are actually satisfied with the product. That’s why we’ve created our behavior-based Customer Satisfaction Algorithm™ that gathers customer reviews, comments and Yammer reviews across a wide range of social media sites. The data is then presented in an easy to digest form showing how many people had positive and negative experience with Yammer. With that information at hand you should be equipped to make an informed buying decision that you won’t regret. What are Yammer pricing details? What integrations are available for Yammer? Pros: The features are very helpful and useful, the layout is simple and easy to use. We are able to perform our basic functions and to meet our clients’ needs. We are able to share files across the company and to interact with each other. We don’t have to use emails in order to share important documents. Whenever we start with new projects we can easily share ideas and files and to keep the updates for the projects. Cons: It would be great if they could improve the mobile app. Pros: Maybe because it looks like Facebook we already know how to use it and how intuitive the tool is. We can easily post and share something we want others to know about, and to interact with others in familiar way. By using “praise” we are able to recognize peers accomplishments. Cons: I don’t like that we cannot post long praises and this means that we cannot express ourselves. The post looks so monotonous. If you need more information about Yammer or you simply have a question let us know what you need and we’ll forward your request directly to the vendor.